Shopping in the snow: about us and what this is all about!! Editor’s (Dad) comment: sorry Tess – I wanted to add a pic! I don’t quite know if I am writing an obituary to my car or a love letter to my bike. My emotions connected to the two have become inflamed by sheer rage. My car has recently cost me £300 in repairs. Repairs I cannot see: no shiny new bonnet to see where the money went. It is all internal. Then, the next day after getting the money-sponge-with-wheels back, it broke down again. This time it will not start. I have abandoned my car for a while. Along with it I have also abandoned any thoughts of car ownership. My car has been of great pleasure to me, but also a great nuisance. Its role in my life has ranged from (perceived) necessity to inconsequence – mostly teetering around the inconsequential. A luxury if you will. For weeks on end it has gathered leaf debris, like dust in an empty house. Yet it has been known to whip up the east coast between Leeds and Edinburgh with a happy me singing at the driver’s wheel. It has hosted happy times, I can’t lie about that. The main reason I decided to get my car was due to an influx of new driver hormones making me broody for a life on the roads. I was also doing the trip between Leeds and Edinburgh around twice a month, but wanting to do it more. The train cost £70 for one trip. The car, well that was only £130 a month. A bloody bargain and a logical decision if my travel was increasing. I had also painted a romantic idea of driving to the hills or to the beach at every spare moment. And yes, at times the car gave me that. It gave me an option for freedom when I craved it so badly. I have been on trips with friends and with family in that car. It moved all my plants from an old home to another. It’s a secondary storage system outside the bedroom wardrobe and its mine. But its financial implications and therefore financial worry marks the end of our rose tinted relationship. This obituary is dedicated to a human-car relationship lying in a pile of road tax and petrol cost ashes. It has drained my money and my Dad’s money (sorry Dad, thank you Dad) for very little gain. I knew how much it would cost, but to “live the cost” is a different thing. To live the cost when you want to spend the money on other things is the ball ache. I love my life now, and I don’t want to travel to Edinburgh with every break in my calendar. Its role has become a drainage system. And no one needs a financial drainage system. What has also become apparent, what it also drains, is the pleasures, experiences (and yes, nuisances) of public transport. And as we all know, if you have been following Carfreefamily, is that public transport is in my blood. As I write this I am on a train. I can see the snowy mountains from my seat and directly in front of that window is my gorgeous soul mate of a bike (over dramatic? Never!!) I am sat, travelling at speed, looking at my two favourite things. Public transport: transport where you can sit and read, watch, listen and talk allows me to absorb more life than any car can. This train I am sat on allows for interaction, reflection and real experience. It’s the embodiment of ‘carpe diem’ if ever I did see it. It’s real and its social and it makes you feel part of something. My memories are about public transport. My childhood, my friends, drinking beer and going to the mountains are on transport. Waiting at stations to meet friends. Cheese and wine with my pall Steve. Arran with Helen when we had to run to catch the train. Missing trains. Cycling to Loch Lomond in the sunshine. Passing through Doncaster. Gosh, even getting on at Doncaster when we were so young. All transport. When I travel I feel my place is valuable and I’m participating and funding something bigger than myself. Something wider and better, more outward looking, inclusive and environmentally friendly than my VW Polo: my tiny metal bubble. I love getting on the train at the moment, especially with my bike. I read and I think, I write, I nap, I converse, I watch and I am happy. Right now, I can’t see these emotions or see my favorite activities within the car. A car doesn’t support these activities like a train demands them. So, I am going to get rid of my car. I am writing this, a diary entry or a letter to myself, or to any one, (potentially to another young Tess Cassidy out there) who is craving the freedom they have been told comes with a car. That fresh pine new interior smell will never beat the dappled light hitting your face as you cycle through a real wood, or as you spot forests, lakes and mountains as you whizz through the landscape. Choose Life. Choose public transport. It’s been an interesting few years in my life since 24 May 2010. In a personal sense and a transport sense. In a personal sense: settled in Edinburgh; daughters have magically grown to 18 and 22; one daughter left home and drives – the other has started living a very independent life and doesn’t want to learn to drive; Mum and Dad both died (I still watch this entry sometimes – it was a lovely day with them (and actually had a big impact on my work)); I met a wonderful woman and fell in love. Constant change. Plus on 24 May 2010 I gave up the car for a year and started this blog about the experience. 30+ entries later and I still don’t own a car. I have learned such a lot about the great things in giving up the car, the difficult bits and the impossible bits which face many people. It’s been an interesting few years in the transport world since May 2010 as well. In July 2010 Uber was born (7 months later they had raised loads of cash for global expansion. July 2012 they come to London)). In August 2011 Gett was launched in London. Lyft was born in August 2012. Nov 2013-April 2014 Ubigo undertook a 100 people trial of Mobility as a Service – subscription to transport not ownership of transport. 2015 MaaS alliance is formed and there’s been plenty written about the concept in the profession since (one of the best is the July 2016 TSC paper). The Golden Lessons I have learnt from giving up the car seem aligned to lots of the professional writing and thoughts on MaaS. I wanted mobility as a service when I started my carfreeness but was actually consuming mobility as a disservice very often. I really wanted one bill for everything (see Golden Lesson 2 (July 2012)). Now there are trials out there that would give me that (if they included all the transport spending that me and my family do – ALL of it). But I also wanted to know very accurately how much I was saving from not having a car: I was asked the question so often (and still am): was it worth it? To get to the answer I (and MaaS) need two things. The first is a clear cost estimate of me and my family’s car-free costs against that of the car – but in a very personalised way: for example you can’t just compare the mileage I did in the year I had a car (if I had that info) with the mobility spend of the year without a car: what trips were degenerated at no real cost to my family? How can we factor in the change of my family’s transport needs? It was a time of constant change in my family and constant change in our travel needs and behaviour. Secondly, I need some quantification of the unexpected benefits of not having the car. These are not the “soft” things – they are the real “hard” benefits I experienced. Probably the biggest learning from my car free life (described in the blog) was the breadth of the unexpected benefits. To catch on, and work as a solution, MaaS needs to answer me loud and clear: Was my mobility better or worse from not having a car? Was my life really improved and made easier and better? This is where the magic of selling MaaS comes. It is also where the business model can be made – through the monetisation of the benefits. I promised 10 Golden Lessons to end this blog – I only got up to 8 which is a bit rubbish. I’ll do the next two – and maybe a few more – but from a professional point of view. Professionally I was prompted to give up the car and start this blog by some great work done by Erel Avineri and Owen Waygood on a EC project I was co-ordinating. Their work within the project included work on loss aversion and stimuli for behavioural change. Plus I enjoy participant observation. I wanted something to make my life easy. We have been designing this mobility within Viaqqio and delivering through Systex and Journeycall (all part of ESP). So I’ll share how Carfreefamily findings are challenged or supported by some of this work as well. Though I must stress – all views expressed here are personal. Never had a Guest Post before – but Lynsey has bitten the bullet and the second car has gone. So here’s the story of the transition of Lynsey and Gordon (and her their three boys Munro, Jock, Hector) to having one car….plus a pic of one of the (sore) unexpected consequences! The main catalyst for trialling our “One Car family” project lies with me being caught for speeding - in excess of 50% of the limit. As it was January and the time where all household insurances and contracts are renegotiated I thought now is the time to live with one car since my car insurance would inevitably go up. Further to this I had recently changed to a three day working week and the office is supplied with good transport links which I used to cycle to when I was a good bit fitter and healthier. Now is the time to get fitter and healthier and use the car less. Other contributing factors which although not paramount were my personal concern with climate change. As a beekeeper I have noticed a significant change in the way my bees behave in the unsettled climate. Taking a car out of the equation would surely help –wouldn’t it? Furthermore, my husband already cycles to and from work and needs a car for work perhaps once a fortnight. If the day he needs the car overlaps with my work then I have many options such as public transport, car share with my sister-in-law or cycle. No problem there! So the question becomes “Why not? – to me there seemed very few barriers that good communication and organisation could not overcome. My husband is very pragmatic and suggested we trial the one car family rather than just selling it (which was my initial suggestion). Read on to find out how the trial went. 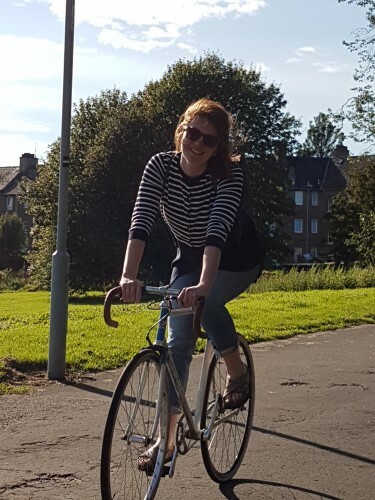 Our second car was SORN (Statutory Off Road Notification) on 1 Feb 2015 and within a week I had to cycle to work as my husband needed the car. Not a problem! I opted for my road bike since it would have less resistance and be quicker to cycle the 7 miles to work. Back in the day I could complete the journey in 28min but it took me 45mins which is hard to stomach: but you have to start somewhere and I was relishing the challenge. I arrived at work unable to stand as I suffer for MS and have issues with temperature control – when I overheat I find it difficult to stand, walk and talk. Note to self – wear fewer clothes next time. The second week I had to cycle for one of the working days and wore fewer clothes. It was raining and fared much better despite having an infected ankle which occurred on the first cycle (see photo). I managed to get a water blister as a result of my cycle shoes rubbing . The blister burst and then got infected due to my immune system being very weak. The wound took three months to heal and required me to car share with my sister in law on the days my husband needed the car. No big deal as it allowed me to catch up with her and what her kids were up to. I view this as a positive. While the second car was off the road it was vandalised (broken windscreen). This made me more determined to sell the second car as it was now costing money for us to keep it off the road. At this juncture my husband was still not in agreement to selling it. Perseverance! Shortly after the windscreen incident, our main car had to go to the garage for a week. My husband reminds me “now we are a no car family!” How can that be an issue? We live in town! As a result we took the train for a weekend trip and the kids loved it. We were able to chat on the journey and did not have to stop for toilet stops. Very positive result. Has the experience been similar to what was expected for me, kids and Gordon? Our weekends tend to be jam packed with activities for the kids. We have found ourselves walking and cycling more as a family and also using the bus and train. The kids love the bus especially sitting on the top deck. As the bus and train continue to be a novelty the kids are pro the one car approach. Let’s hope that lasts. I think it has been easier than expected. When the car is not there the temptation to use it is removed. Communication and planning has improved between us and that has strong feel to it. There have times when it has been frustrating but they have been few and less as the time has gone on. It has, perhaps, stopped us doing something we would have normally done or altered our plans. Sometimes we might not achieve as much in terms of box ticking during the course of our busy weekends. During the week the impact has been limited. Only on one occasion did I have to hire a car and it is easy to do this at low cost and short notice these days. What have been the unexpected benefits? I communicate better with my husband as we now need to plan ahead and we compromise and we are both getting fitter although I find I eat more when I cycle. I also know more about what is happening in my sister in laws life – not sure she likes that! I have cycled to work pretty much every day and although at first this was hard work in bad weatherI now don’t htnk anything of it. Tips to others giving up? Who looks after your mobility now you have started using other modes? 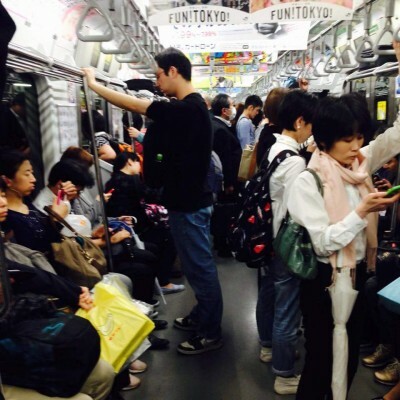 Tess, my lovely 20 year old daughter, is currently in Tokyo. The first picture she has sent me is of a crowded train. The first message she has sent me tells me that she has been on the busiest train station in the world. The second picture she has sent me is of said busiest station in the world. Transportation pics and facts – she knows how to make me happy. One could argue that Tess and my lovely 16 year old Maddie are a bit more tuned in to transporty issues than many – being part of Carfreefamily and having a Dad that has constantly gone on about public transport, making them look at ticket vending machines and tickets and assess buses in foreign cities, and design smartcards (enjoy the personalised smartcard designs from 2003 developed by Tess, Maddie, Chloe and Lottie during a “Smart Media Design Workshop” we held on a wet day in South Uist in 2003). Of course, like many parents, I over-egg my own influence on them, though us not having a car has meant that they need to think a bit more about travel options as a lift from me is not possible (see earlier posts). For example Maddie has a demon knowledge of Lothian Bus routes not because of me, but because she uses them a lot. So what happens about learning to drive? During time out from University Tess decided she wanted to drive and driving lessons duly became the present of choice from family and friends. 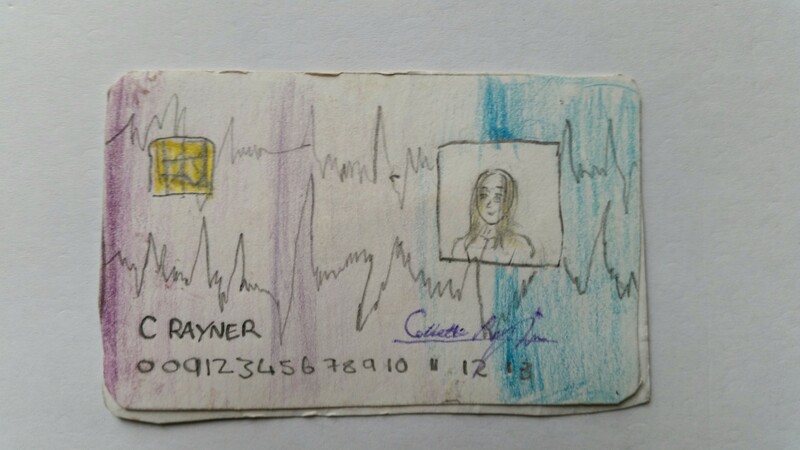 Getting to a decent level, and having passed her theory test, she ran out of money and time and started University in Leeds as a non-driver. Coming back from University for Easter she had arranged lessons and a test and aimed just to give it a go. On 13 April she passed her test. Wow – well done. More about motivations in learning to drive some other time – Tess’ mainly governed by having some time on her hands and thinking it would be a useful life skill to have. [She is bucking the trend - driving is declining amongst younger people - see "Decline in Young drivers" research in the links - from Beth's great site]. Passing your driving test feels like a mammoth step towards adulthood: this exclusive level of independence which allows you to do what the hell you want and whenever the hell you want to do it. In the first weeks since I passed my test it was just about the need and desire to drive. Walking to college, to the gym, I was constantly assessing people driving and imagining what I would be doing if I was sat in one of those cars. Lights turn to solid amber, take the car down to second gear! It was really annoying actually. On top of this I was obsessing over what car I want – Googling for small cars in which I can just toodle up to Edinburgh from Leeds if I just feel like a nice tea instead of rice and pesto. It’s so stupid -I don’t really need a car but driving is new and fun, that is all it boiled down to. I also was thinking a car seems like the answer to my current life of feeling trapped in Leeds, a City I don’t really want to be in and don’t really know well – a way to get out. However, I think it’s just like when I buy a dress because I feel fat: I don’t need the dress, Its just my mind that needs a wee fix. A consumerist thing..
As time has progressed and now that I have some access to a lovely little car (Thank you Julie and Jenny) my opinion has changed a lot. I don’t want to own a car now. I don’t like the responsibility (haha) of having to make sure it’s safe and well parked. And I really didn’t like the parking ticket I just got! I don’t like how friends are so keen to go on a drive, like it’s the best thing to do in a day. It is still somewhat nerve-racking driving which just adds stress to my days. Overall though, I would say the biggest thing that has put me off wanting a car is how awful I felt when it was just me in there driving along amongst all the other cars with just one person in them. It feels awful, consuming that much energy and resources just for one person, doing routes which could have easily been taken by bus, probably safer and more relaxing too. It really is scary how many of us choose to drive -especially for those when there’s easy alternatives. 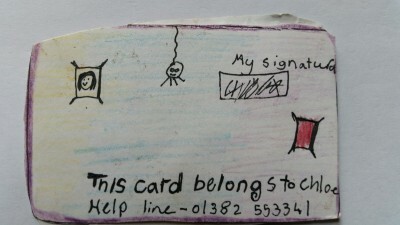 For a person who has never really been exposed to daily car journeys (car free family problem!) it was definitely a shock. Being able to drive and sometimes having access to a car has definitely helped me make my life more flexible. It allowed me to go to my friend’s at 10pm and leave at whenever I wanted (1am) because I don’t have to rely on getting a bus and finding the change. It allowed me to see my boyfriend but get home in time for tea. 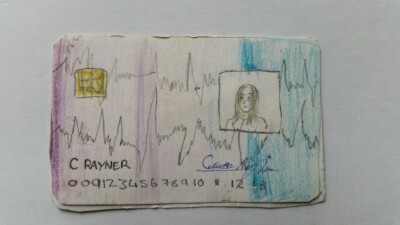 And having this license means I can hopefully go drive round Iceland and go on some country walks with my friends. Looking back at the last months the car certainly hasn’t enabled me to do completely unique things or given me a life line - it has increased the pace of my daily life and my chances of dying. Oh and DEATH….. yes certainly she has an increased chance of dying with traffic accidents being the largest cause of death for 16-24 year olds. But how fantastic is this as a part of the solution? Benny wanted to be faithful to the reality of behavioural economics, but Bjorn, always the snazzy one, insisted on the lyric actually rhyming. The winner takes it all, the loser feels at least twice as bad as the winner. Because that’s just how it is. We as humans assign much more weight (about twice) to losing, say £100, than we would to gaining £100. Behavioural economics calls it loss aversion. And out of all my lessons from Car Free Family-dom it is perhaps the most scary, important and useful- everyone focuses on the LOSS of the car, and not the gains of not having a car – many though they are (direct and indirect – see Golden Lesson 7). And, as Benny knows, when the focus is loss it will be very difficult to give up. Benny was a car driver. I and others always speak about “giving up the car”. This language will always stress the loss = double the gain. It makes change difficult to contemplate. To help people make (an informed) transition there’s a need to highlight the gain and present the loss and gain in different language and in different ways. It’s called loss framing. Its the key to helping us make a change – to counter the cognitive bias Benny was so aware of. Of course this links directly to Golden lesson 1. It’s exciting the think of how to do this (building on some of the other Lessons) – something we’re working on in my day job. ** For a great review of loss framing from two academics who have great insight into this topic check the Behavioural Economics link – from an EC Project I co-ordinated 2009-2012. Have a look at D1.1 in the Deliverables. Written by two good friends and colleagues Prof Erel Avineri at Afeka College, Tel Aviv and Prof Owen Waygood at University of Laval in Quebec. 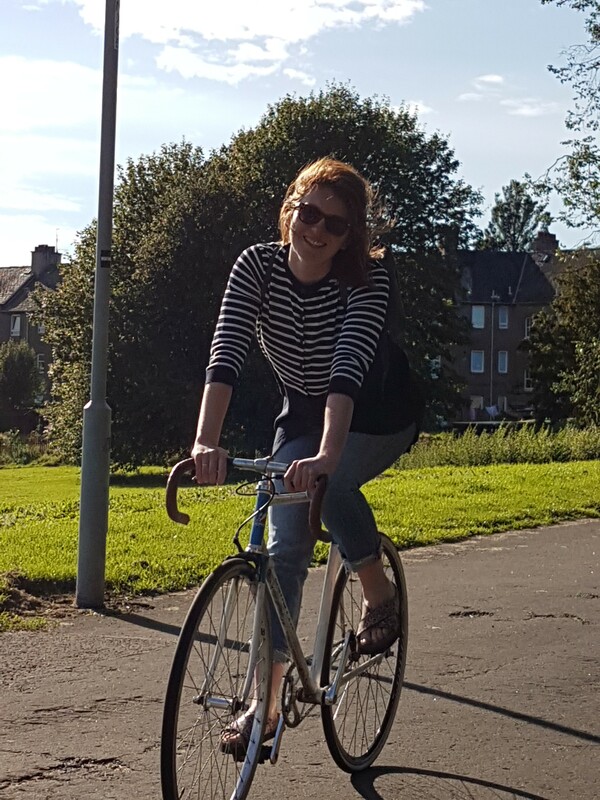 As I try to round off these Ten Golden Rules/Lessons learnt I reflect on what I felt like when we started on our car free life. I’m not sure what we really expected but there were a few worries and plenty of optimism. I honestly was not sure if we would last out our trial year without a car, or if we would continue being car free after that year (its now coming up 5 years). There have certainly been some unexpected consequences of car freeness: things I didn’t ever imagine would happen. CAREFREE CAR FREE: How happy I have felt not having to “care” for a car. The hassle of maintenance gone. And the unexpected bills – tyres etc. But the biggest thing is the hassle – taking it to the garage etc etc. Car stuff. Not for me anymore. BYE BYE MONKEY: Not emptying the boot or cleaning the car out when it was full of toys and mess and other little things like that used to get to me. I never washed my car but this didn’t bother me at all. But I also never really cleaned the car out. (A stag beetle once cockroach crawled into Maddie’s shoe when it was left in the boot. I felt bad after I had forced it onto her foot ignoring her heartfelt complaints that the shoe felt funny on her toes.) Cleaning out the car and bringing stuff into the house. It was just ANOTHER job I HADN’T done. A monkey on my shoulder. So its bye bye to that particular monkey. DEMON DRINK: I have drunk more. I have not been a designated driver. I have taken buses and taxis. An alternative interpretation is that I have relaxed over a beer more often. I’ll go with that version. WHEN IS A TAXI NOT A TAXI? : The amount of taxis I have taken has surprised me. There’s been a lot of trip generation there. I guess I just see taxis as justifiable now – I don’t spend money on a car so taxis aren’t a problem when they fit my need. I have reconceptualised taxis: they’ve gone from being a bit of a luxury to being a mode of transport which fits into my life. STATE OF INDEPENDENCE: The independence of Tess and Maddie – especially when they were younger teens. There is no car available for me to give a lift so they walk or bus. And they don’t think that strange. I have not worried about them getting out and about and to their various activities when I am out of town on work tips. It doesn’t need me to make arrangements for lifts etc and worry if they have worked. Ok they have asked for taxis every now and then (as they have become older - if its v late and they want to get home, or if they are v late to get somewhere) but generally they sort out their own mobility. Sweet. Oh and they love their bus passes. THANKS DAD: Even better – IF I offer to get a City Car Club car and give a lift they are SO grateful. It doesn’t take much for me to do this – the Car Club car is round the corner – but it is a bit more of an effort than just taking your own car off the driveway. They know this so it’s a big thank you from them. Of course my daughters are lovely so they always say thank you, but I don’t feel like a taxi service. And they are thankful. You get my point. So this is the reality of the unexpected – and there are a few more besides. Some of these are what the transport people like to call in-direct benefits – all the extra things that are quite often discounted by transport modellers who try to explain behaviour and evaluate decisions. But these things are very real. And they have made a difference to me. Some (transport modellers!) see these as the fluff and extra bits left over – not the main things explaining my car free choice. 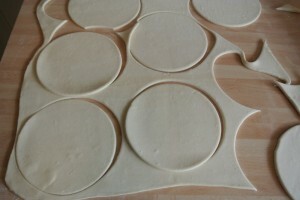 But like my Mum who always took the off-cuts of pastry and made them into jam tarts, when you rub all these extra bits together its amazing how important these “extras” can be. Not fluff – real stuff. Important in making and continuing a car free decision. This was certainly in my list of unexpected impacts of car freedomness: I have become a more discerning consumer of, and thus promoter of, different kinds of cars. OK – I have not been car-use free, but car-ownership free. But whenever I have decided to use a shared car I have thought about the various features I want from a car. Passenger space, economy, size of boot, proximity to my home, size of load I am carrying (eg taking very large loads to recycling etc). Sometimes, being “irrational” I have also become attached to one type of car – I remember my Fiat 500 phase well. It’s great that I have a choice around all these parameters – if you own a car you haven’t. You have made the one time guess (at purchase) about the type of car which best suits your overall needs. How rubbish. I now tell friends about the relative merits of the Toyota Hybrid Auris Estate, Yaris Hybrid, Nissan Leaf, Toyota Aygo, Peugeot Expert Van, Fiat 500. 1. That I am doing this at all. I have never been into cars at all and know little about them. I have now found myself giving advice to friends about car purchases (after trying to get them to eschew ownership). I have found people actually asking me about hybrid cars as they are new to hybrid and have never driven one. 2. That I am now discerning per trip based on features. I’ll make a choice based on a range of gadgets, requirements that best suit my needs. Imagine a world where many people have given up their car ownership and are consuming mobility as a service – sharing lots of cars. They will be trading off between models and features like…..…wildrabbits! It will reinforce the importance of features and technologies. It will be a community of people talking about and consuming these features in real time – not one at a time every time they buy a car. We may get a car industry supporting an important car share market and learning lots for their (hopefully smaller level) car sales market. Lots of opportunities there for all stakholders. I live in a small flat. I have two teenage daughters who have grown quite a lot since we started this blog. 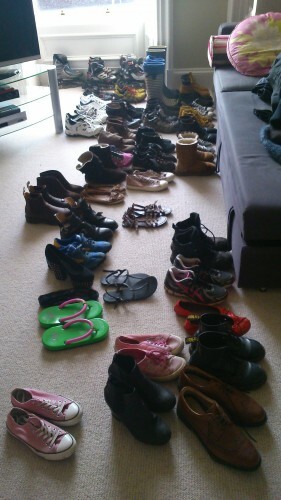 They have acquired many pairs of shoes in that time. I have often raised a call to arms to do a shoe cull. Usually this has resulted in maybe 2 pairs of shoes exiting the flat. It has never worked – we are overun. A few weeks ago I tried a new method to get Family Cassidy to focus on the “Shoe Problem”. So I was up early one morning and prepared the living room to expose the full nature of the problem. It was a bit of a surprise when they awoke. Initially it led to lots of warm reminiscing about shoes and moments they had shared (the shoes in question and Tess/Maddie). This was an unintended cosequence, though maybe part of the “letting go” process. 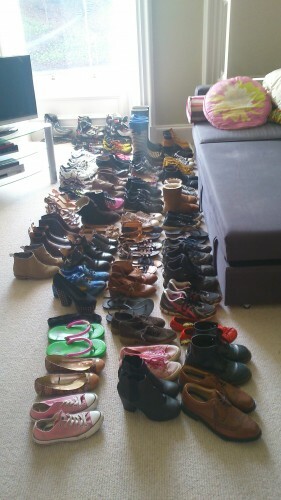 However, this presentation of the shoes in the living room also made a cull much easier to achieve and the shoe population was decimated (well, let’s say reduced quite a bit). Overall I think it changed the context of the decision. I think this is important in bringing about change. When I gave up the car for the initial year I was forcibly changing the context of my mobility decision making. It made me look to other ways of meeting my mobility needs- it made me look at other ways of living my life, choosing new ways of travelling, comparing and contrasting prices/availabilities etc. It was a bit of a pain doing this - it wasn’t exactly seamless (see Golden Lesson 2) – but I had to do this. And even if the car isn’t being given up – it’s not an option for many people – some tool would be useful. Cassidy Family have learnt that there are so many benefits from giving up the car/walking more/using public transport more etc, as this blog has talked about. However, only by easily and seamlessly and personally answering the questions above can the context of decision making be changed and new ways of mobility be seen to be “worth it” “for me”. Ideally such tools would facilitate action as well – “yes I am reassured and I have guarantees that it’s for me – I’ll buy in now and I will start benefiting now”. A change in the context within which to make personal mobility decisions and a view to a new future context for personal mobility/lifestyles. Below is my favourite quote – in fact the only one I know! It’s applicable anywhere there’s a problem. For Golden Lesson 5 aswell. Individuals (and cities and rural areas) have transport problems. There is a need to think differently to solve them. There is a need to change the context within which thinking and decisions are taken. It’s The Shoe Culling Principle – change the context for decision making – change the terms of reference – reframe the problem – find a new solution – make action easy. Oh, and make it fun. It has been nearly a year since my lovely Mum died suddenly aged 81. 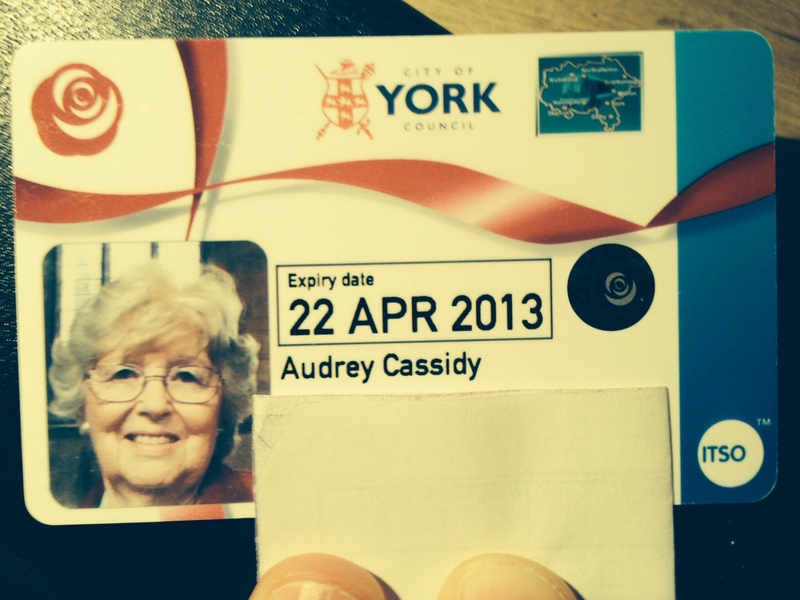 I am carrying her bus pass around in my wallet. She loved her fee travel bus pass. 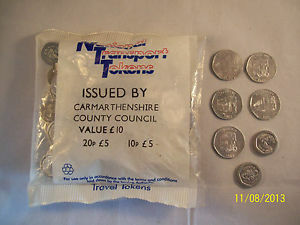 Before her bus pass she loved her National Tavel Tokens: a bag of “travel money” which could be spent on various forms of transport. She used to keep quite a few to spend against her train travel down from York to Doncaster to see us. She also loved her taxi account we sorted for her when she was struggling to use the bus for all her needs once the car had gone. Though she was mobile and connected throughout her life. As a very small child I remember going into town with her and my sister on the bus. The Number 1 from Tang Hall Shops (next to the phone box we used to walk to every other Sunday to call my Aunty Eileen). I remember her playing games with us at the bus stop so we wouldn’t get too bored and agitated waiting 10-15 minutes. And I remember us all sometimes running for the bus, out of breath and laughing. And as a small child I went to so many places on a small seat attached to the cross bar of her bike. It was a hard black shiny plastic seat. Up to Muncaster to see my Aunt Lorna. She used to cycle to Rowntrees to work an evening shift packing After Eight chocolates. She said when the whistle blew at the end of the shift there were hundreds of bikes all coming away from Rowntrees rushing home. She’d bring home a few broken After Eights for us as a treat, and her shoes would be caked in them. It must have been 1973? She had learnt to drive at aged 40 – about that time – but my Dad had the car. I have often thought of that saddle on the bike. We had the same type for our kids, and Tess and maddie remember moments on that saddle so vividly. I wonder if it made cycling a ready form of transport for me – the norm? I have always cycled quite a bit – not as a fanatic cyclist – I mean it would just be odd not to use a bike. I have often used it as a main form of transport to work. Even in London – cycling from Penge to Marylebone via Hyde park Corner in all weather. I loved it. Buses and bikes. Just the norm as a kid. Lots of shared experiences. There’s a great quote in Saturday Night Sunday Morning by Alan Sillitoe: Love is experience shared. I wonder if the mobility experiences we have as kids pass on in some ways – making a certain travel way of life the norm? I know many people who hate buses and bikes – have they had this passed on to them? Never used them as kids and the occasional negative parental comment about “bloody bikes” or never dreaming to catch a bus. Maybe my kids are having car-free-ness passed on? We have experienced laughs and jokes in the car when we had one – but they are less vivid than the run to the bus, or the shared bike ride, or even the bus ride with other people around on the top deck and the walk to the shops. And even our chats about being car free – they instil a culture. My colleague Beth (see the BethLikes link on the right) is doing her master dissertation on this topic: why are younger people driving less? I know I remember vivdily my travel as a child. The black saddle. The bus stop games. I know i loved, and still love, After Eights. I know I loved my Mum very dearly. And I am pretty sure that if your kids are opened up to new ways of doing things they get some form of innoculation which keeps that thing living in their lives. And here’s a lovely video that made me think of our bus stop games with my lovely amazing Mum. The other day I had been thinking that there are certain things that older people just seem to know: names for flowers, how to knit, the names of birds. Then at Bristol Airport there it was, scurrying around outside the main terminal exit. The older lady was walking very gingerly dragging a huge suitcase on wheels with one hand, and gripping her handbag and walking stick with the other. She confirmed all my preconceptions with her reply – “I just do”. What she didn’t know was where the Airport to Bath bus left from, and when it would leave. I had already been sniffing around inside the terminal to find out the same. I knew from a friend that there was a direct bus from the Airport to Bath and that it would take about 45 minutes. 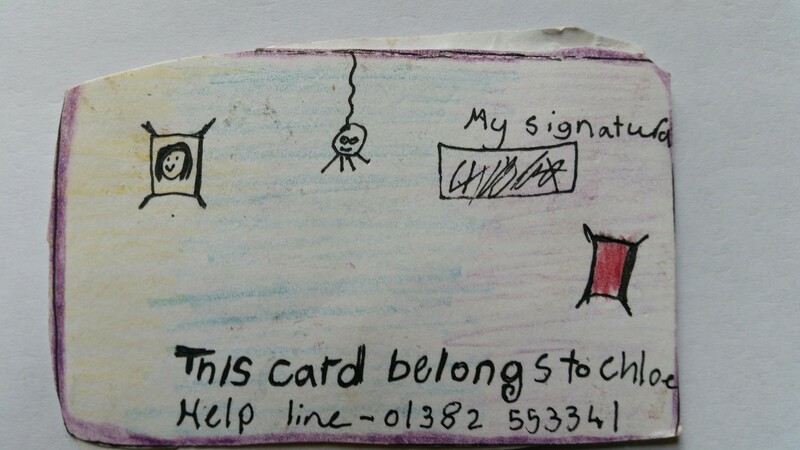 But when I called at the Information Booth the man was describing in great detail to a young woman what he would do if he had 6 hours to spare in Bath, so I got bored after 3 mins and retired with a leaflet. Found it – but I wasn’t sure when it left though – no timetable. But looking back over my shoulder I saw a real time display – it would be here in 10 minutes at 0930. Sorted. I summarised the above somewhat more succinctly to the lady who introduced herself as Nora. I also pointed out that the bus was sat in the distance (about 100m away over the busy main entry road) just waiting to come across at the right time. Nora headed off. “Stop!” (The Wagtail flew off in fright) “Best to wait”… at the rather unassuming bus stop. 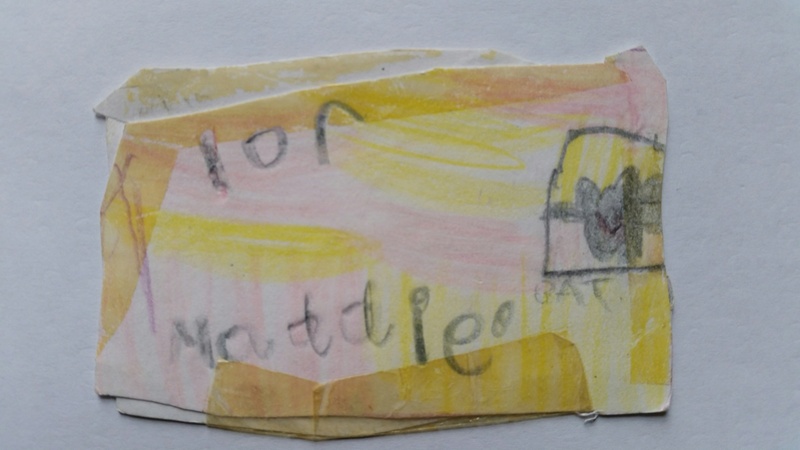 Nora knew about the bus from her grandchildren she was going to meet in Bath. 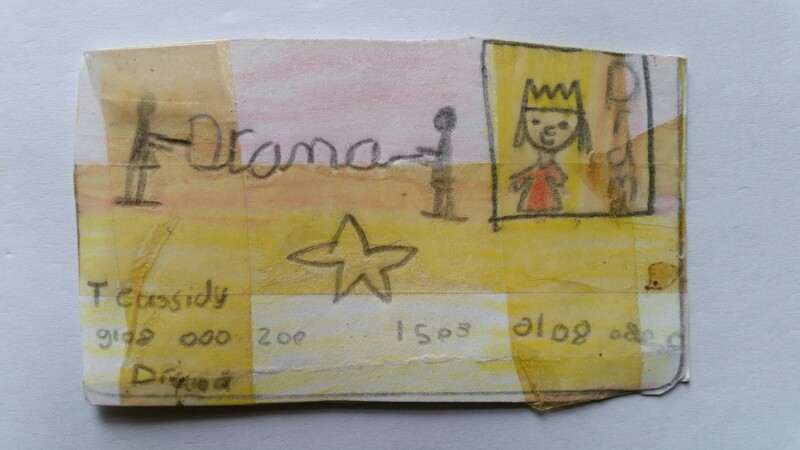 Nora knew she could use her Northumberland Concessionary bus card. Nora knew she was doing well at 81, three years after major heart surgery, to do this trip again. It had knocked her confidence, she said. Nora didn’t think she’d get over the surgery to travel again. Just like she hadn’t got over her daughter dying at the age of 48 from cancer. She cried a little when she told me that. But she had managed to do both. It had been quite a morning for her. And I didn’t know was how light her huge bag would be as we boarded the bus. I estimate that it carried 1 toothbrush. Did the journey take 45 mins? – No. 1hr 20 mins. Nora said as we got off “It’s not exactly Express is it!”. Trundle trundle trundle through Keynsham…Brislington…Bishopsworth. What is an Express journey from Bristol to Bath, really? The journey time really threw Nora. Real fear set in about her return journey – how long should she leave for the journey? She had to leave early for the return anyway as her return flight was v early - now she would have to leave even earlier. WHEN? When we alighted the bus she was mightily relieved that we only had to walk 20 metres to the taxi rank – integrated transport thanks to the design of the Bath bus/rail/taxi hub. Excellent. Bus stops don’t have to be shy. Transport and travel information – yes. But they can be so much more. Confidence is a big thing for anyone keeping mobile. Keeping mobile is a big thing in keeping your physical and mental health. Well done Nora. And well done 90 year old Frederick from Dundee who sat next to me on the plane back from Toronto the other week. He’d been to celebrate his 90th with his little sister (82) who emigrated years ago and had picked him up from the airport. And well done my 88 year old Dad. He has not sounded as happy for ages as he did today on the phone. Why? He walked to the Dr – the furthest he’s walked for a year since my Mum died. He’s still got it. 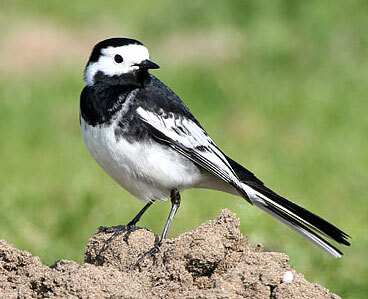 Pied Wagtail:A delightful small, long-tailed and rather sprightly black and white bird. When not standing and frantically wagging its tail up and down it can be seen dashing about over lawns or car parks (courtesy RSPB). At work – carbon reduction! !